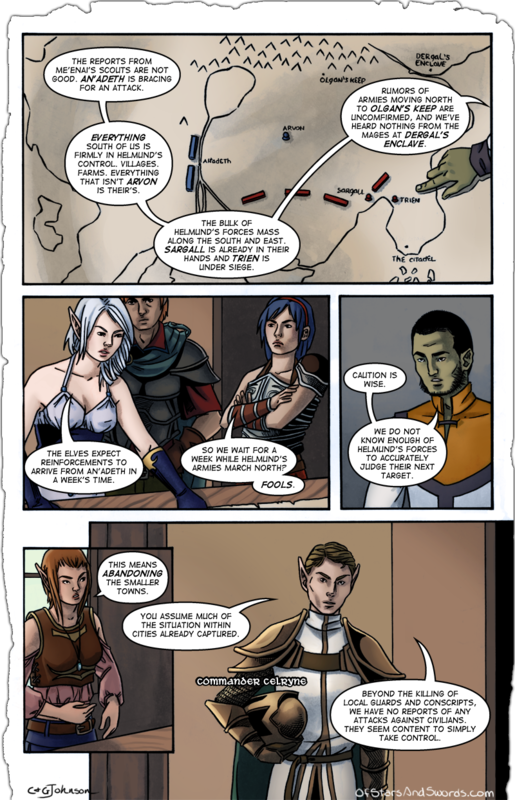 So this week, in addition to the new page and the new part of Cato’s story (below), we’ve got a third thing for you to enjoy! Over on our art blog, we’ve put together a detailed look at our creating process. You can see every step of how today’s page was put together by heading over to this link. Cato and Kyros had grown up on a small farm outside of an unremarkable village on the northern coast of the main island of Orincia. Their childhood was, more or less, normal. They played when they were young, worked when they were able, and fought whenever the opportunity arose. It was not fighting out of anger or hatred, but the more normal brotherly fighting over anything they could find an excuse for. This led to a very early development for both boys. From an early age, they both learned to run. Running from one another, simply racing to see who could reach the village first, or escaping from the parents of local girls. Cato and Kyros were always on their feet and always moving. It had been good training for where their lives had gone, running across the islands and, more than once, running out of a city with a cadre of local guards on their heels. Rarely did Cato think about their time growing up, but it was hard to forget it when a mob of screaming, angry local Orionans were currently after him. He couldn’t help but wonder if, without all that running as a child, he’d have been killed years before. Killed because of Kyros getting into trouble. Again. Cato made a quick mental note to hit his younger brother when he had the first opportunity. First, however, he decided it was far more important to keep his mind on the problem at hand. Cato risked a quick glance over his shoulder as he ran as fast as he could manage. Damn. They hadn’t given up. At least twenty people were chasing him. Most were unarmed, save for furious looks on their faces. But a few of them were carrying weapons. Cato was able to spot a dagger, a couple of torches — because what kind of mob would this be without a torch even in broad daylight — and what looked like an iron pan. But before he was able to process all of the information, Cato’s head was facing forward again and he was back to navigating immediate issues. At full tilt, it was difficult to avoid the various people in the streets that had not joined the passing mob, but Cato was doing his best. The yelling from the people behind helped to clear the way ahead. So far, all that had been required of him was to shift away from a few slow, shocked individuals and loudly apologize over his shoulder for knocking a full basket out of a woman’s arms. The four guards that Cato saw approaching ahead of him, lightly armored and with short swords drawn, were about to make things more interesting. Cato’s eyes darted around him, taking in the surroundings as he continued running forward at full speed. Two carts full of crates to the left. Boarded up windows on the building behind. Closed door next to that. An alley between two buildings that ended just a few meters in. Wooden bridge on the second level of the city directly above. Makeshift ladder against the building to the immediate right. Stairs to the second level just past the incoming guards. Too dark to see down the two alleys on the right side. Too many people gathering on the sides of the street to get out of his way to make ducking into any of the open buildings a viable tactic. Stuck between charging the guards and the pursuing angry mob. This, Cato decided, was his punishment for years of simply putting up with Kyros’s insanity rather than locking the kid up in the cellar when he’d been small enough to carry. Life would have been so much easier with that choice. Quieter too. No time anymore. The second level. Cato needed to get there, get up higher, then figure out a way to get back to Kyros at the other end of the city and…and…and work out the and later. Cato resisted the urge to draw his sword as he reached the four city guards. Killing these people wouldn’t do him any good at this point. He just needed to get out of their way and somehow lose them in a city he’d only been in for about twenty minutes. Without killing anyone. Or further angering of the populace so that maybe, just maybe, Cato could talk all this down when people were feeling rational. And then there was no more time for thinking. The four guards were to him and did their best to box him in as they approached more carefully than his full-speed running. That was the only advantage Cato could find that he had: momentum. “Stop!” the center of the guards yelled. Of course he said that. They always said that, even if their target was standing still. Cato wondered if there was a book that told all guards all over Orincia exactly what to say no matter the context of the situation. Unsurprisingly, Cato did not stop. He simply shifted his angle of attack directly for the guard that had spoken and angled his right shoulder towards the man. The guard was smart enough to see what Cato was planning, and instead of swinging his sword at the charging man, he dove out of the way. That was not in the playbook Cato was used to, so he was pleasantly surprised to not have to barrel through the man. Cato didn’t hear if he got a response, as he didn’t slow down or even bother to look back. Instead, he continued right on for the stairs to the second level, pushing a younger looking Elf out of the way and bounding up the stairs, three at a time. The stairs took him around and up to the much more cramped pathways on the level above, and Cato quickly realized this was going to be difficult. Finally, Cato was forced to stop. Two paths lay ahead of him. One straight ahead, off to the western section of the city and relatively empty, and the other back south, overlooking the street he’d just come down. It was also extremely crowded due to onlookers that had watched his escape. Sanity would say to head west and attempt to loop back around the long way. The problem with the suggestion provided by sanity was that Cato didn’t know the layout of Oriona at all. So far, he couldn’t tell if the city was actually a grid or a mess of streets and buildings stacked next to and on top of one another, but Cato was leaning towards the latter. So, in the end, Cato really had no choice if he wanted to get back to Kyros, and some stupid part of him that seemed to like trouble and nearly getting killed did. Before he attempted to brave the crowd that was staring at him in shock and worry, Cato risked a look down the steps. Immediately, he wished he hadn’t. The mob had caught up to him, and the guards were caught in its midst, trying to get to the front but seemingly finding it easier to just move with them and yell louder about how Cato should stop immediately. As Cato looked forward to move again, he realized a new problem had already grown in the moments when he had looked behind him. Many of the people that had been simply watching from above were now, very purposefully, blocking his path forward. They had stern looks and seemed ready to do anything to stop him. This was why stopping was a bad idea. Cato looked above him. The third level of the city about ten feet out of reach and there was no time to climb. That wasn’t going to work. Ahead of him, beyond the blocking crowd of people, he could see the nearest of the wooden bridges that crossed above the main street. And as his eyes took it all in, Cato found a very, very narrow path. Without thinking about how bad he’d always been when it came to balancing on narrow ground, Cato leapt up onto the marble railing that prevented citizens from falling from one level to the next. He got his footing, barely, and ran.